OXFORD, England (CNS) — A prominent Catholic ecumenist has urged a better understanding of the Russian Orthodox Church. “Those suspicious of the Russian Orthodox stance should go and see what’s happening,” said Barbara Hallensleben, a consultor with the Vatican’s Pontifical Council for Promoting Christian Unity. “Of course, nationalist and ideological tendencies are always at work. But a lot of people in Russia are promoting Christianity — and by creating relations, we can strengthen church life and proclaim the faith with them,” said Hallensleben, who hosted anniversary commemorations of Pope Francis’ 2016 meeting with Russian Orthodox Patriarch Kirill. The Feb. 12 anniversary symposium at Switzerland’s University of Fribourg included participation by Cardinal Kurt Koch, head of the Christian unity council, and Metropolitan Hilarion of Volokolamsk, the Russian Orthodox church’s foreign relations director. “The pope said unity means moving together, not just holding talks — and what’s amazing is how the style of ecumenism has already changed,” said Hallensleben, who co-directs Fribourg’s Ecumenical Institute and sits on the International Theological Commission. “We’re exchanging pilgrimages to see how we each live the Christian faith and engaging in a much more extensive cultural ecumenism, as well as working together on the great challenges facing today’s world,” she said. 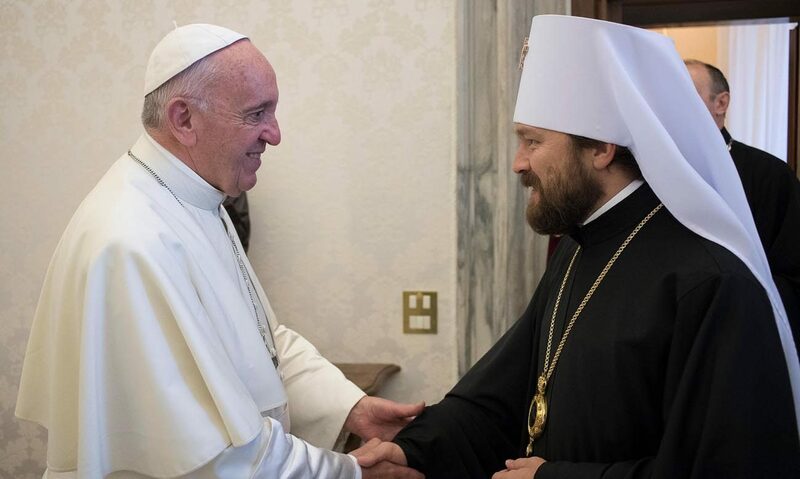 Ties between the Vatican and Moscow Patriarchate are widely believed to have improved since the Cuba meeting, but are still marred by intra-Orthodox rivalries and the alleged government links of the Russian church. Hallensleben told CNS that speakers at the symposium had listed “very concrete bilateral projects” launched in the past year, including theological debates, joint concerts, exhibitions and student exchanges, as well as a joint April 2016 delegation to Syria and Lebanon to aid persecuted Christians.